At the dawn of the Renaissance, it was widely believed that a new golden age of artistic creativity was unfolding. This rebirth of elegant beauty, with its pleasing visual curves, and graceful delicate ornamentation, found its way into all art forms including tapestries, architecture, stained glass and sculpture. However, no where was this artistic revival more evident than in the tile work of the time. These designs were adapted from the magnificent art of the Renaissance period. This tile is hand-painted in New Hampshire. The vibrant enamel glaze is permanent and will never wash or fade away. The ceramic tile, which is heat resistant, can be used as a trivet or hotplate, as well as hung for wall decor. 6" x 6", Cork backed. Wipe clean. 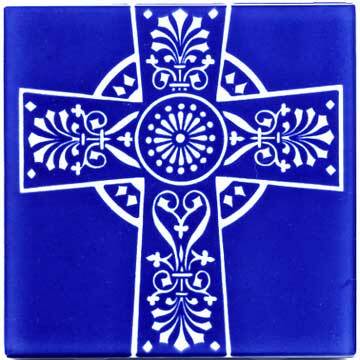 These highly collectible tiles make wonderful gifts.